Editor /March 16, 2013. Additional content provided by David Englehardt and Carlos Bertot. 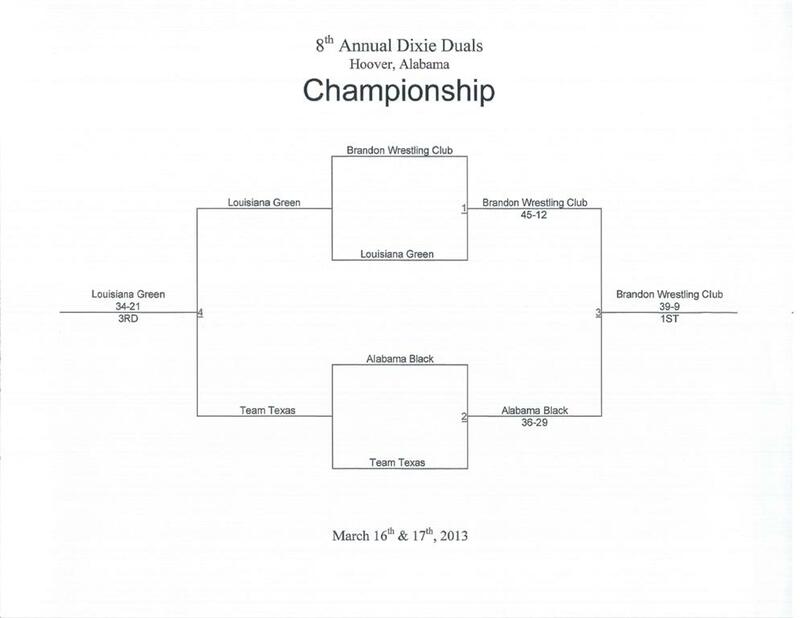 The Louisiana Green team will be wrestling in the championship bracket on Sunday at the Alabama Wrestling Club's Dixie Duals in Hoover, Alabama, for the second straight year. 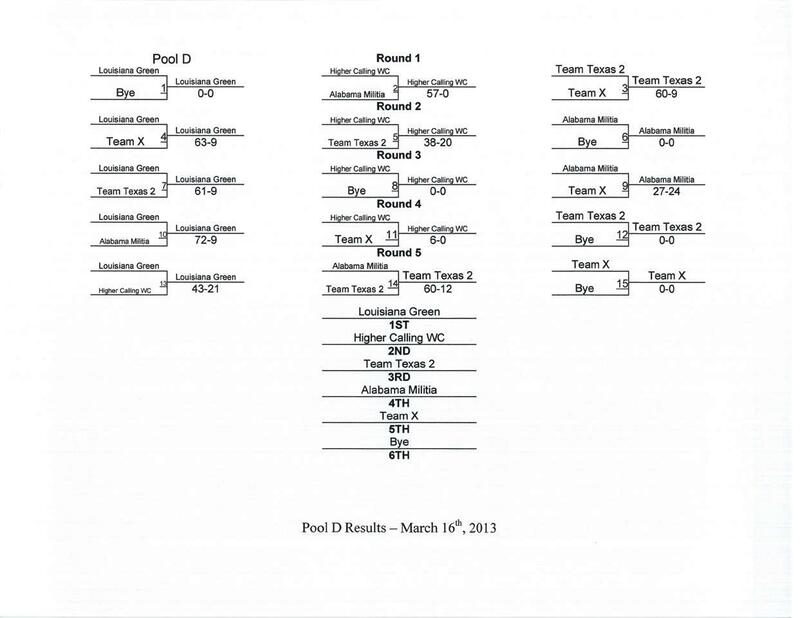 The team defeated all four opponents it faced in Pool C and received a bye for a 5-0 record. They will be one of four teams wrestling in the championship bracket, starting with a dual against the Brandon Wrestling Club of Florida. The two Louisiana all-star teams, the Louisiana Green and the Louisiana Outcast, are competing against 18 other all-star teams from Alabama, Florida, Georgia, Tennessee and Texas. Louisiana high schools represented by the two all-star teams are as follows (# of participants): Brother Martin (5), Brusly (3), Catholic (3), Comeaux (2), Dutchtown (1), East Ascension (3), Holy Cross (2), Jesuit (5), John Ehret (3) Live Oak (4), Northside (3), Parkview Baptist (2), Rayne (1), San Houston (1), Shaw (1), St. Paul (2). 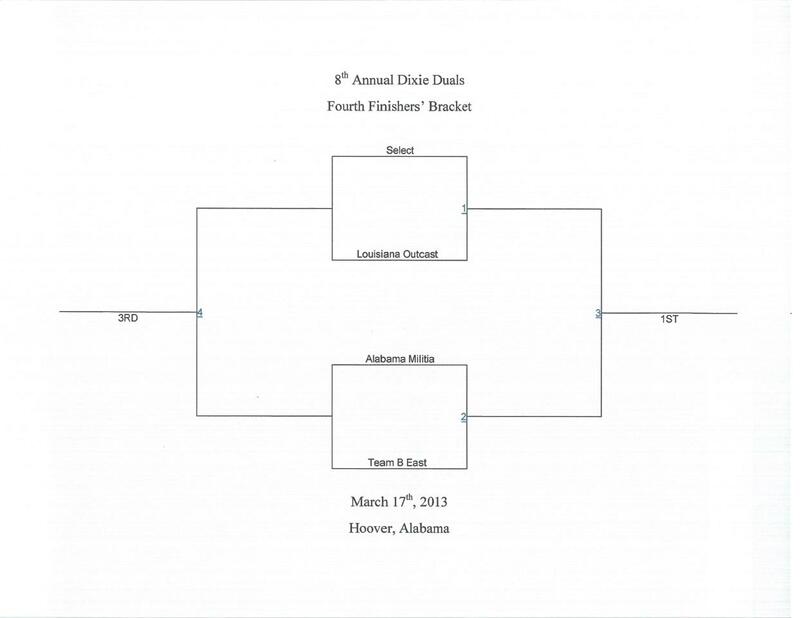 The teams include eight Division I, four Division II and three Division III Louisiana state champions. The teams are coached by Carlos Bertot and Richie Dixon of Division II champion Holy Cross, J.P. Pierre of Division I champion Brother Martin, Greg Romano of Division I runner-up Jesuit, Kenny Whittle of Parkview Baptist and Graham Karwath of East Ascension. Connor Campo and Cody Hill led the way for the Louisiana Green with four wins apiece. Brandon Luckett was 4-0 including one forfeit. Sidney Rodriguez and Kyle Delaune went 3-0 during the day and Jacob Chenevert went 3-1 with two falls. Last year the Louisiana Green team, led by seniors Scott Gibbons of Rummel, Nick Michael of Holy Cross, Gerard Roman of Brother Martin and Phillip Miller of Teurlings Catholic, won the tournament with a 25-24 victory over Team Texas in the finals. 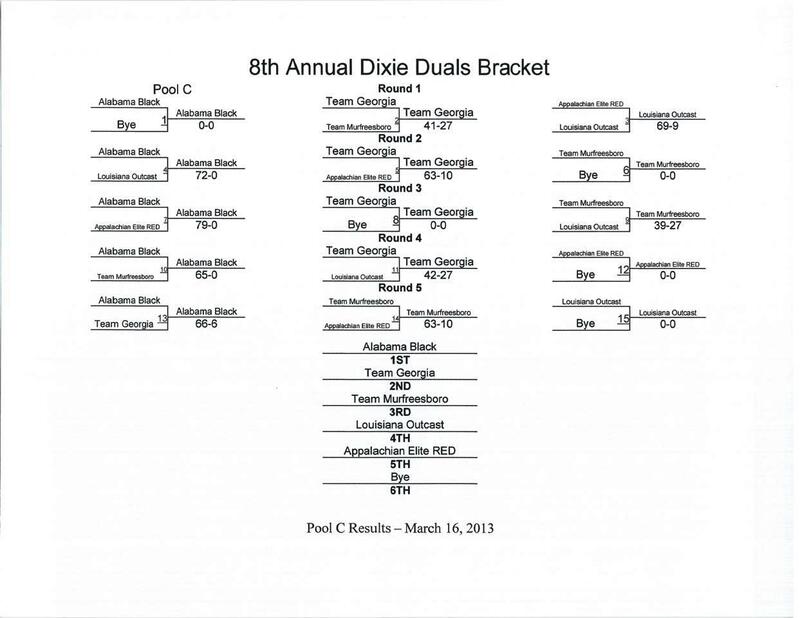 Members of the Louisiana Dixie Duals teams who participated last year and who are on this year's rosters are George Benoit, Ross Brister, Connor Campo, Mitch Capella, David Englehardt, Stefon Foster, Gage Grush, Cody Hill, Marshall Hill and Conor Karwath. The Louisiana Outcast team did not have as much success in Pool C. They won their first dual handily over the Appalachian Elite RED team 69-9, but did not win a match against their next opponent, the Alabama Black. Their last two duals were close, but they ended up on the short side of 39-27 and 42-27 scores. Alex Betteridge went 2-0 with victories via a 7-3 score and a 2:18 fall. Billy Marcantel and Orlando Calhoun, Jr. each went 3-1 in their four matches. The Louisiana Outcast team was in Pool C on Saturday and faced Appalachian Elite RED (Tennessee), Alabama Black, Team Murfreesboro (Tennessee) and Team Georgia. The Louisiana Green team was in Pool D on Saturday and faced Team Texas 2, Team X (Alabama), Alabama Militia and the Higher Calling Wrestling Club (Tennessee). Information and results listed here are from the TrackWrestling Website. Additional information will be published as it is received. The Louisiana Outcasts consist of Alex Betteridge (EA), Colt Olinde (LO), Connor Stampley (COM), Andrew Aucoin (SH), Baret Sanchez (BRU), Corbin Clouatre (PVB), Jacoby Guillory (COM), Trevor Schermer (BRU), Brandon Cowell (DUT), Marshall Hill (PVB), Kaleb Faul (CAT), Koby Mancuso (BRU), Billy Marcantel (RAY), Orlando Calhoun, Jr. (NS), Daniel Kincade (NS), Conor Karwath (EA) and Allan Kincade (NS). They are coached by Kenny Whittle and Graham Karwath. Louisiana Outcasts received a bye in Round 5. 150 Kaleb Faul Loss: Inj. Def. The Louisiana Green consists of Jacob Chenevert (LO), Nicky Charles (JES), Mitch Capella (JES), Cody Hill (LO), Paul Klein (BM), George Benoit (HC), Stefon Foster (JE), Connor Campo (StP), David Englehardt (StP), Sidney Rodriguez (CAT), Gaston Eymard (JES), Efosa Eboigbe (JES), Kody Woodson (SHW), Brandon Luckett (CAT) Daniel Albrecht (BM), Kyle Delaune (BM), Gage Grush (JES), Andrew Blanchard (JE), Michael Yeatman (HC), Josh Tapia (BM) and Ross Brister (BM). They are coached by Carlos Bertot, Richie Dixon, J. P. Pierre and Greg Romano. Louisiana Green received a bye in Round 1.